On the 1st (Wed), explore the activities along Victoria Nile and then relax and float downstream with a rafting and tubing tour. On the 2nd (Thu), you'll have a packed day of sightseeing: look for gifts at Jinja Art Studio, contemplate the long history of Source of the Nile - Speke Monument, and then glide peacefully along the water with some of the best stand-up paddleboarding in the area. To see ratings, photos, more things to do, and more tourist information, read Jinja trip planner. Amsterdam, The Netherlands to Jinja is an approximately 16.5-hour flight. The time zone difference moving from Central European Time to Eastern African Time is 2 hours. Expect somewhat warmer temperatures when traveling from Amsterdam in May; daily highs in Jinja reach 30°C and lows reach 21°C. Finish up your sightseeing early on the 2nd (Thu) so you can go by car to Masindi. Masindi is a town in the Western Region of Uganda. 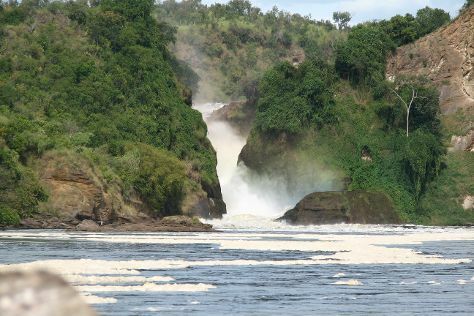 Kick off your visit on the 3rd (Fri): explore the wealth of natural beauty at Murchison Falls National Park. Get ready for a full day of sightseeing on the 4th (Sat): stroll the grounds of Polish Cemetery Masindi and then stroll through Rhino Fund Uganda. To find where to stay, other places to visit, reviews, and other tourist information, go to the Masindi journey builder website . Drive from Jinja to Masindi in 4.5 hours. Alternatively, you can take a bus. May in Masindi sees daily highs of 33°C and lows of 22°C at night. Wrap up your sightseeing on the 4th (Sat) early enough to drive to Kabale. The sleepy market town of Kabale in Western Uganda, although meagre in sights of its own, boasts close proximity to several national parks, just a couple of miles from the border with Rwanda. On the 5th (Sun), explore the wealth of natural beauty at Bwindi Impenetrable National Park. On the next day, look for all kinds of wild species at Wildlife Areas and then identify plant and animal life at Wildlife Areas. To find reviews, where to stay, maps, and other tourist information, refer to the Kabale route planning tool . You can drive from Masindi to Kabale in 8.5 hours. Other options are to do a combination of bus, car, and flight; or do a combination of bus, car, and flight. Traveling from Masindi in May, expect Kabale to be slightly colder, temps between 26°C and 17°C. Wrap up your sightseeing on the 6th (Mon) early enough to travel to Kampala. Spend the 7th (Tue) spotting exotic species with a safari tour. Spend the 9th (Thu) wandering through the wild on a nature and wildlife tour. And it doesn't end there: take in the natural beauty of Katwe Tourism Information Centre, take in the spiritual surroundings of Gaddafi National Mosque, take a peaceful walk through Maramagambo Forest, and look for gifts at Uganda Crafts 2000 Limited. To see ratings, maps, and other tourist information, read our Kampala online day trip planner . You can do a combination of car and flight from Kabale to Kampala in 5.5 hours. Alternatively, you can do a combination of bus, flight, and car; or drive. Expect somewhat warmer evenings in Kampala when traveling from Kabale in May, with lows around 22°C. You'll set off for home on the 10th (Fri).